US President says nation will not tolerate countries which receive billions in aid from US but turn against it at the UN. US President Donald Trump threatened to cut off aid to countries that vote against his decision to recognize Jerusalem as the capital of Israel at the UN General Assembly on Thursday. 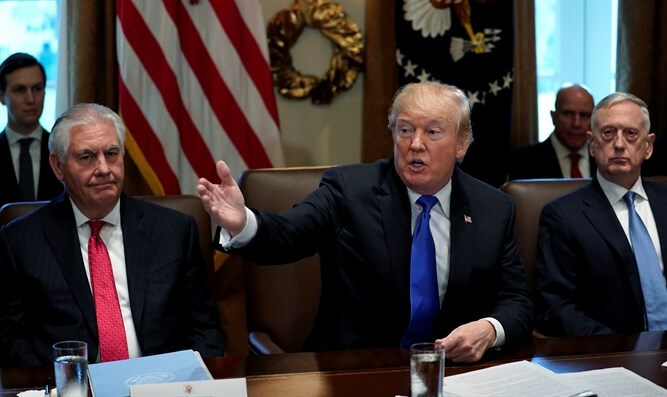 Speaking at the last Cabinet meeting of 2017, Trump said that the US would take note of the countries which receive hundreds of millions, and even billions, of dollars in US aid and still criticize the US at the UN over his acknowledgement of Jerusalem as the capital of Israel. The Palestinian Authority and its allies submitted a resolution to the General Assembly condemning Trump's recognition of Jerusalem and pledge to relocate the US embassy to Israel's capital, after the US vetoed a similar resolution at the Security Council. On Tuesday, US Ambassador to the UN Nikki Haley warned that the US would be "taking names" on the countries which voted to condemn the US recognition of Jerusalem. “At the UN we're always asked to do more and give more. So, when we make a decision, at the will of the American people, about where to locate OUR embassy, we don't expect those we've helped to target us. On Thursday there'll be a vote criticizing our choice. The U.S. will be taking names,” Ambassador Haley tweeted.